I was working outside this week and heard a buzzing sound fly past my ear and the sound of something small hitting concrete. 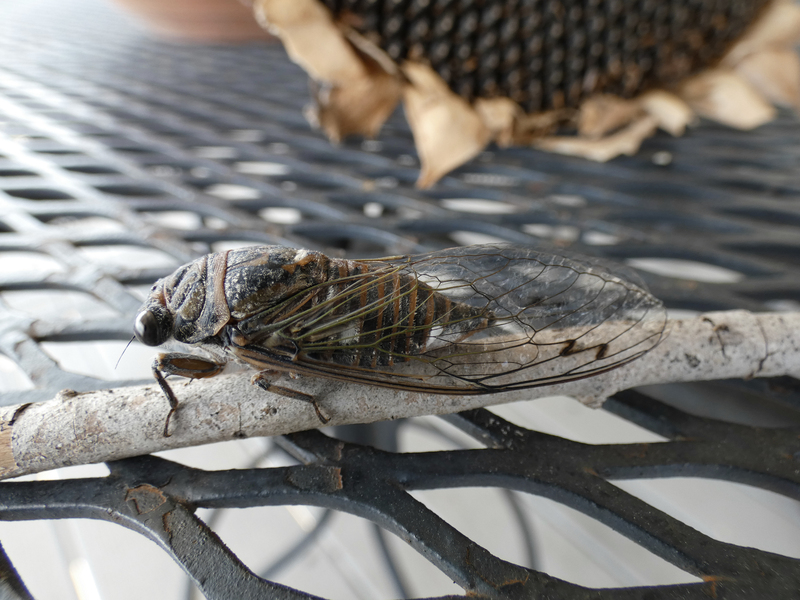 I looked over at the drive way ramp and saw a cicada on it’s back, not moving. I found a small stick and offered it to the cicada. It grabbed it with its feet and I carried it to the porch, hoping to give it some shade and a safe place to recover from whatever had caused it to crash to the ground. It was not the usual green cicada I am used to seeing. I googled central Texas cicada to see what I could learn. It turns out this is a Dog-Day Cicada. They are an annual cicada with a 2-5 year life cycle. I have heard of longer life cycles and those apparently are periodical cicadas, and complete their life cycle in 17 years. 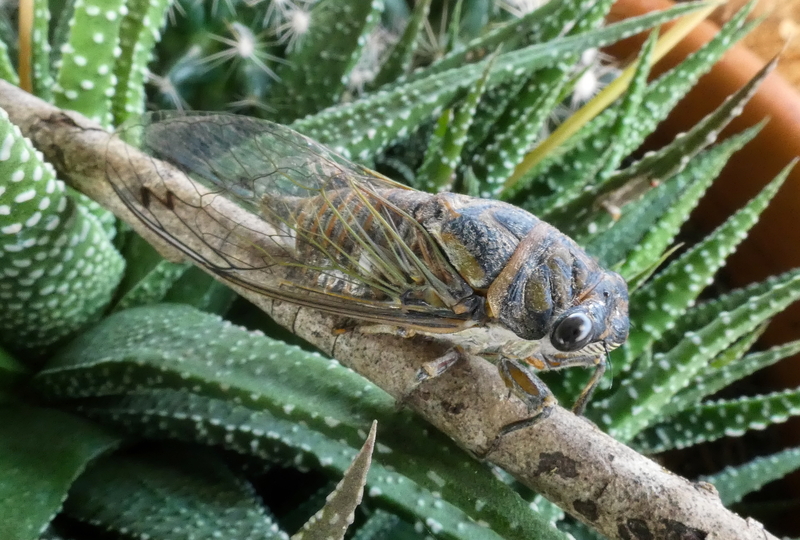 (The article in the blue link above, from the Texas A&M Agricultural Extension states the Texas periodical cicada can complete its life cycle in 13 years) The Dog-Day Cicada’s coloring varies widely from green, brown and dark brown/black to green with black. This one appeared to be mostly brown and black, but the green showed up more depending on the lighting and background. 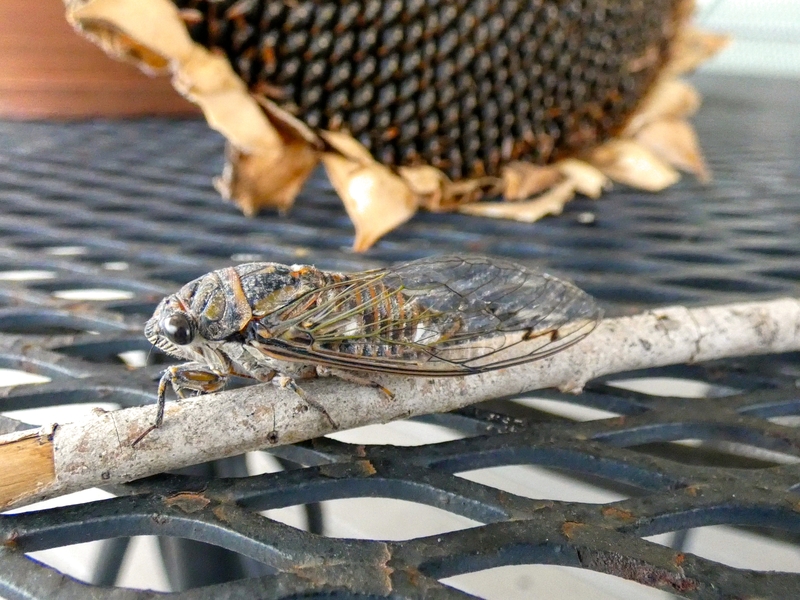 Once I had taken a few photos and noticed that the cicada was starting to move around a bit, I moved it to a larger potted plant where it could continue its recovery in relative quiet and safety. When I checked on it later, it had gone. He looks smaller than the 17 year cicada? A very lucky little cicada, to have found some gentle assistance. I think he has a has a 2-5 year cycle. At best guess it is a Dog-Day cicada.